Click on picture to view larger image.Click on picture to view larger image. 3 patterns for the price of 2! Pattern includes instructions for 3 projects...wool applique penny rug, cross stitched picture and a punch needle cherub. #387 Cute as a Button! 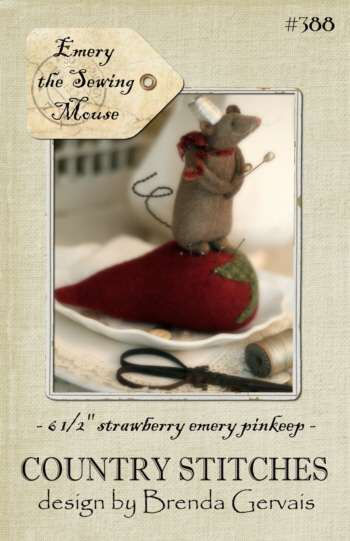 A pattern for a sweet little mouse that is perched upon a sewing pinkeep with an old thread spool base. Mouse is constructed from wool felt. Piece measures 6 1/2" tall. 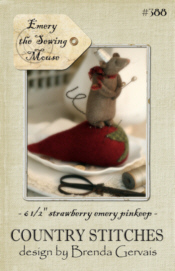 Pattern for a whimsical little mouse on a wool strawberry emery. Emery's hat is an old sewing thimble! 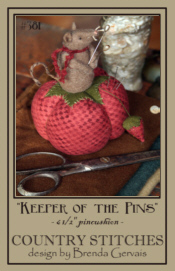 A fun pincushion for your collection! Pattern for a 10" x 27" penny rug. 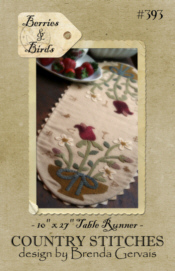 Rug is a nice mix of wool applique and cross stitched motifs on prairie cloth. Ric Rac edging adds a nice touch to the finished piece. 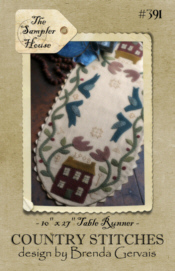 Pattern for a 10" x 27" table runner constructed from Prairie Cloth and wool. 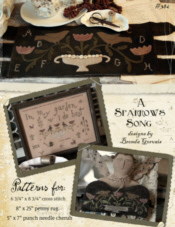 Simple cross stitched motifs adds additional detail and charm to this lovely piece. 3 patterns for the price of 2! 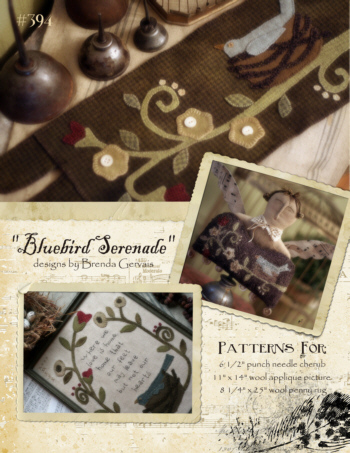 Pattern includes instructions for a wool applique penny rug, embroidered/wool applique stitchery and a sweet punch needle cherub bust on an oil can base. Great pattern! 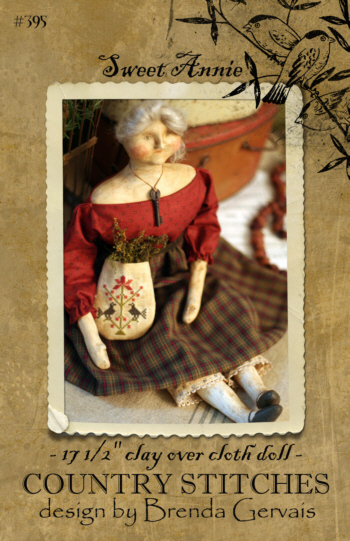 Pattern for a 17 1/2" sophisticated doll that is constructed from PaperClay and cloth. Pattern includes large colored step by step instructions for forming clay body parts. Sweet Annie has a sweet little ditty bag with cross stitched motifs and filled with her favorite flower. Natural flax is used for her life-like hairdo. Wonderful piece! NEW pattern for a sweet little wooly mouse that's perched upon a plump wool flannel tomato pincushion. A strawberry emery dangles from the piece to help keep your needles sharp. 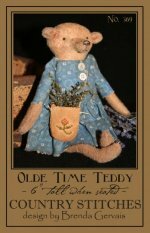 Let this wee one keep track of your pins and needles. Pincushion measures 6 1/2" tall. 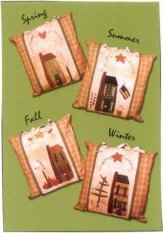 One pillow for all 4 seasons! This 14" x 14" pillow has a tie-on panel that you turn or flip over to change with the season.